Celebrate the Seattle Wine and Food Experience 11th Anniversary! The Seattle Wine and Food Experience weekend returns on February 21-24, 2019 with an itinerary of three unique epicurean events. The eleventh annual weekend of local feasting and tasting includes Comfort (Thursday, Feb. 21), POP! Bubbles & Seafood (Friday, Feb. 22), the ever-popular Grand Tasting (Saturday, Feb. 23) and a brand-new addition: Sunday Supper (Sunday, Feb. 24). The newest addition, Comfort, kicks off the weekend on Thursday, February 21 at SoDo Park. Cozy up with Seattle’s best feel-good foods and crafty brews from mac and cheese to burgers, beer, cider and more! Indulge on sweet and savory bites from local gastropubs and taverns while sipping on a diverse array of craft beverages. Held at the glamorous McCaw Hall on Friday, February 22, Pop! Bubbles & Seafood highlights Pacific Northwest seafood for a quintessential Seattle experience. Top culinary talent will prepare fresh and sustainable seafood including oysters, salmon, crab and more. The evening will feature more than 30 sparkling wines from around the world including: west coast sparkling wines, Spanish cava, champagne and Italian prosecco plus seafood-friendly white wines and reserve reds. 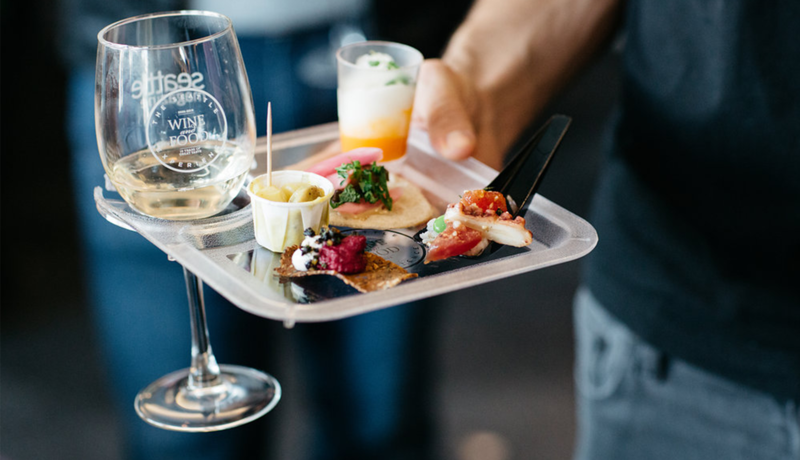 The flagship Seattle Wine and Food Experience Grand Tasting will take place at Bell Harbor International Conference Center on Saturday, February 23, featuring more than 30 chefs, 100 wineries and dozens of beer, spirit and specialty food purveyors. New this year, the Grand Tasting will feature a Seattle Magazine Lounge where you can taste a selection of the ‘100 Best Things to Eat in Seattle’ featured in the February issue of the magazine as well as winners of the annual Washington Wine and Beer Awards. And finally, to wrap up the weekend with a unique new addition, Sunday Supper will take place on Sunday, February 24 at Block 41. A curated list of Seattle’s top chefs will come together to create a once-in-a-lifetime dinner experience, with each chef serving up an inspired course as part of an epic immersive meal. This will be the most high-end event of the SWFE weekend, with guests enjoying a prix fixe, multi-course meal along with wine and cocktail pairings in an intimate setting. After dinner, guests will get to take part in the “Chefs After Party” where they can mix and mingle with the chefs and producers along with music, late night snacks and a celebration to cheers a successful weekend. The SWFE Weekend Pass package includes tickets to Comfort, Pop! Bubbles and Seafood, and a VIP ticket for the Grand Tasting ($250). *Sunday Supper is not included in the weekend pass. Tickets are on sale now at www.seattlewineandfoodexperience.com. This is a 21 and older event, all admitted must have a valid I.D.